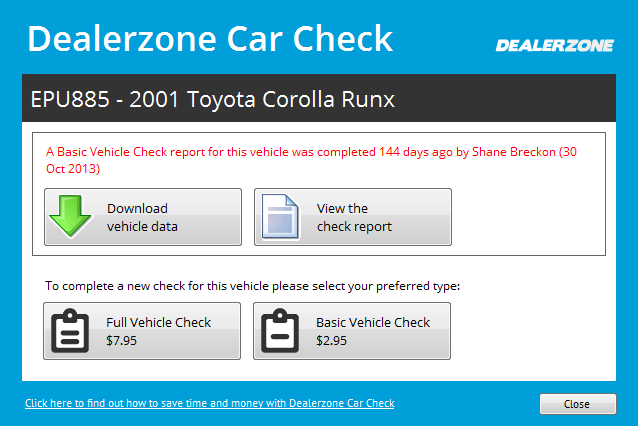 You will need an existing Dealerzone Account to access the Dealerzone Car Check information. To obtain a FREE account you can sign up online here or contact us on 0800 623 687. The Dealerzone Car Check service allows you to generate a report on your selected vehicle including Vehicle Details, Odometer History, Ownership Details, PPSR Check, RUC Check, Stolen Check & Fuelsaver Info (see sample here). You can also utilise the information in this report to populate a vehicle in Motorcentral, saving data-entry time and ensuring greater accuracy. You can initiate the Dealerzone Car Check screen from the Menu Bar of the main window. Simply enter the Registration Plate No or Vehicle Identification Number (VIN) of the vehicle you wish to query then hit ENTER or click the blue arrow button. Please Note: If the last time you performed a Vehicle Check report was more than 30 days ago, the initial message will be displayed in red to alert you to the fact that this report may now be to old to consider the information as relevant. You may want to perform a new check (see below) when this occurs to ensure the most up-to-date information is available to you. You can also start a new Car Check report from within the Dealerzone Car Check screen. Once open simply click the Full Vehicle Check or Basic Vehicle Check buttons. This will initiate a Car Check report for the selected vehicle. You can change the Plate or VIN of the car you wish to run a Car Check report on at any time by re-entering the Plate or VIN in the area provided. Once entered click the Refresh button and the details of any matching vehicle will be displayed enabling you to ensure you have selected the correct vehicle.